Within our Using Video in Social Media workshop, a request we regularly get asked for is to use case studies that don’t feature videos for clients that were the result of huge production budgets. One of our favourite examples that we therefore talk about in the session is a video from Discover Great Veg (below), provided to us by Sara Davis from Ceres PR, who produced the video . Anyone who works in social media knows just how much content you need to populate a feed. Generating original content can be costly, so smaller brands could be put off producing video. 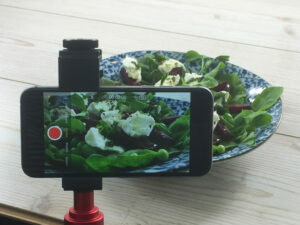 Despite some production houses charging upwards of £20K per video, you can make a recipe video with an iPhone, a little help with the cooking, time and imagination. What you do need, is investment in production, props and a promotional budget if you’re distributing the content yourself. Whilst the ‘Tasty’ type videos may look like a synch to knock up, there are certain factors to consider both in the content side and the technical side before you begin. At Ceres we always use a home economist to ensure the food is perfect, which leaves me free to do just about everything else myself. 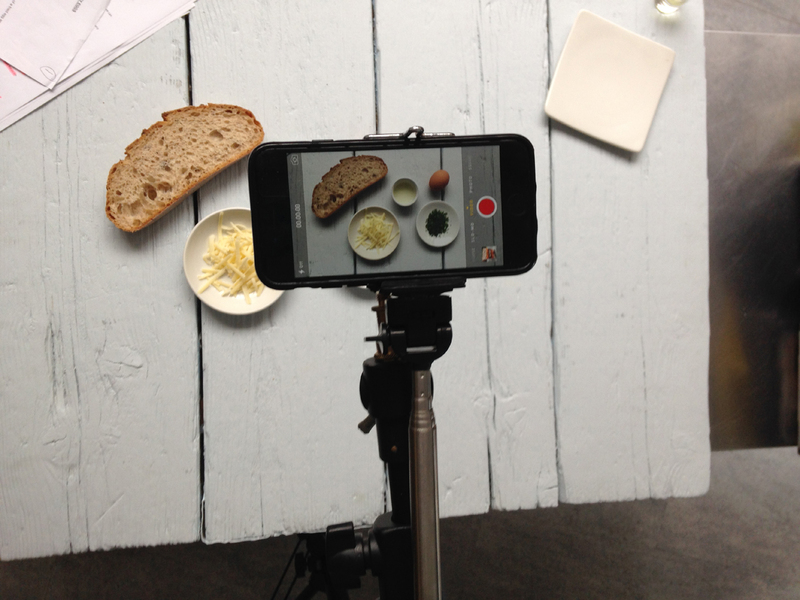 Firstly, what you need is a simple recipe that’s going to look mouth-watering when cooked, the final video needs to inspire people. Think either colour or indulgence. Beef Bourguignon may taste great, but it’s difficult to get a brown stew to ‘Wow’. Melted cheese and running poached eggs look particularly good, or something healthy and colourful that will ‘pop’ off the screen. You then need to break it down into a few simple stages to give the gist. You can post the full recipe as a link at the end, so forget the minor details and focus on making it look easy, achievable and delicious. Plan each stage and what props you will need. This is where you can add some subtle personality to the video. Bowls, chopping boards, plates and napkins etc. all help create a certain ‘feel’- we have amassed quite a props store and I always keep an eye out for interesting stuff when I shop. It’s worth taking note of food magazines as food styling in photography gives ideas on current trends. Years ago it was all white plates and close ups, now it is much more lifestyle based with wider shots and more props to create a mood. Avoid anything shiny if possible, go for matts and textures as everything will look much more ‘premium’ and you won’t get camera or light reflections. At the planning stage it’s useful to know which platform you are shooting for – YouTube & Twitter require landscape, Instagram needs square and Facebook can take either. Knowing this in advance helps with props and framing, particularly for any captions you may need to include. You may need to shoot some sections twice to accommodate both formats. I have a Canon 7D and an iPhone6 which I use to film. Both are good and I use them in different ways. The iPhone is particularly good for overhead shooting. I try to set the position to the widest I will need during the recipe and leave it locked off so I can edit seamlessly. I use my DSLR for some close ups and cutaway shots which give more depth to the piece and can also be used as bridging shots to get from A to B if needed. Lighting is something to watch out for. I try to use natural light where possible as it’s so powerful (and free!). Unfortunately in the UK, though the weather isn’t consistent so artificial light is a necessity and I have a set of LEDs to give things a boost when needed. The time needed depends on the recipe itself. We cook everything on camera, even if it might not make the edit, and we only re-shoot a section if there is a problem. What I do take time over is the final dish as this is the selling point, so I will spend time styling it with props and shoot a variety of shot sizes and angles. A word of warning – those delicious M&S type shots with cream running seductively down a dessert can take an AGE to film as food doesn’t take stage direction very well – so build in extra time and ingredients if you plan on getting some movement in there. It’s almost always worth it, but you do need patience. I edit everything on Final Cut Pro X as I find this is the quickest programme to get professional results, especially with all the captions involved. Of course it’s not just about the footage, choosing the right music can take hours if you let it, as there are an infinite amount of tracks out there. It’s worth choosing a track first and then cutting to the beat as this can help give the video some rhythm and pace. Ideally the shorter the better and it should definitely be less than a minute to sit on Instagram. Facebook is less restrictive, and it will loop anything 30 seconds or less for a maximum of three times which can help to attract attention to your content. I try to start and end on a good shot of the final dish to lure people in – if I get hungry editing it then I think I’m on the right track! Fortunately, in my job there’s always loads of delicious food around and because the role is quite physical I tend to burn it all off straight away. The downside is…nope, sorry there isn’t one. What can I say? Please use the contact form to enquire about fees and to book our Using Video in Social Media workshop at your offices for your wider team.